Powers/Abilities: Andi Benton's alien symbiote provides her with superhuman strength (lifting 5 tons), endurance, and agility. It is bulletproof, and can shapeshift to appear to be any type of clothing, disguise her appearance, or blend in with the background, becoming essentially invisible. It can also form claws, tendrils, or bladed weapons. It can produce organic webbing that she can use for a variety of functions, including web-slinging or entrapping foes. It is resistant to poison or diseases, and can heal Andi's injuries. 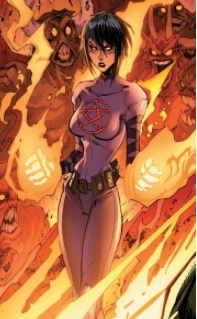 Thanks to her symbiote's Devil's Mark, she also has some control over demons. While under the full influence of the Mark, she had full control over demons, could summon hellfire, and wielded a flaming sword. 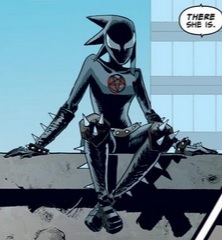 Her symbiote can be weakened by sonics or fire. History: (Venom II#38 (fb) ) - A student at West Philadelphia High School, Andi Benton lived with her father; her mother, who had been full of secrets, was no longer with the family for some reason. (Venom II#31) - Andi overheard her neighbor Robert Fricks yelling at a new tenant in her building. 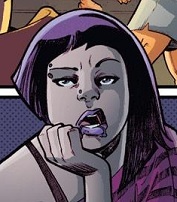 When Fricks left, she told the man, who introduced himself as Flash Thompson, not to worry about Fricks. She rebuffed his attempt to be friendly, however, and took off. (Venom II#32) - As per usual, Andi didn't dress for gym class, and lingered on the bleachers while Coach Yates introduced his new assistant coach, Flash Thompson. She explained why she wasn't participated, as there was no point in getting sweaty and exhausted first thing in the morning, then feeling gross all day. She also introduced Thompson to resident West Philly jock Darius "The Franchise" Fowler. (Venom II#34) - Andi found a beaten and bloodied Thompson on the roof of their building. When she tried to help him, he angrily told her to go away (hoping to keep her safe from Toxin, who'd left him in that state); she stormed off and left him there. (Venom II#35) - Andi was at school when the alien Symbiote Slayers came looking for Thompson. He hustled her and her fellow students into a classroom, and promised her that they'd be safe. After he and Toxin handled the aliens, she and the others evacuated the school, none the wiser. (Venom II#36) - Once more having failed to dress for gym, Andi watched the rest of the students play dodgeball; Coach Thompson warned her that she might fail the class. When Fowler started bullying the other students, Thompson used his symbiote strength to huck a ball at him...which Andi just happened to see. (Venom II#37) - At school, Andi saw Thompson talking to reporter Katy Kiernan. She overheard them talking awkwardly about Venom, but when Andi asked him about it, he claimed not to know her. (Venom II#38) - Andi had breakfast with her dad, and asked him for advice about Thompson - she'd figured out his secret, and wanted to help him somehow. That night, they both watched Wheel of Fortune together; as he became excited about solving the puzzle, she excused herself to go downstairs to talk to Thompson. When she knocked on his door, however, she only found Jack O'Lantern (actually a brainwashed dupe of the real Jack), who sought crimelord Lord Ogre's bounty on Venom. He chased her back to her apartment, where she told her father to call 911 just as Jack burst through the door. Before he could do any harm to them, however, Venom burst in. Mr. Benton also fought back against the villain, hitting him with his wrench; Jack retaliated by stabbing him in the heart with his scythe. As Andi held her dying father, Jack hurled deadly gas grenades at her; to save her life, Venom tried to extend a piece of his symbiote to her, but an entire segment (actually a clone of itself his symbiote had absorbed some time earlier) detached itself and bonded with the shocked teenager. (Venom II#39) - Andi overcame her shock and picked up her father's wrench, using her symbiote to transform it into a giant jagged claw. She tore apart Jack's doll robots, then turned her attentions to him. She started brutalizing him, shattering his helmet, but Venom restrained her when he saw Jack's face and realized he wasn't the real Jack. After he explained that he was the real Jack's puppet, he flew out the window; Venom and Andi pursued him, but Venom told Andi to stay behind. When she refused, he tried to call the symbiote back off her, but it wouldn't budge. They carried on, eventually finding the fake Jack with several of Lord Ogre's other assassins; Constrictor, Lord Deathstrike, and a group of Nakh ninjas. She took out Lord Deathstrike, saving Venom, then grabbed Jack and began asphyxiating him. Venom told her that he'd help her get through life with the symbiote - but if she killed Jack, she was on her own. She relented, and released him. The two left the villains webbed-up for the police and took off. Later, after her father's funeral, Andi moved to Jenkintown to live with her aunt; she still kept in touch with Thompson via untraceable black-market Starkphone, and fought crime in her symbiotic alter ego. (Venom II#42) - Mania and Venom went to an abandoned casino in Atlantic City, where they summoned Mephisto. Venom demanded that he remove the Devil's Mark, but Mephisto laughed off his threats, and explained what had happened - Venom's symbiote had passed the Devil's Mark to a clone of itself it had absorbed some time ago, and then expelled that clone on to Andi. Before they could talk further, however, the D.O.A. attacked. While Venom tangled with their leader, Crossbones, Mania took out several of their ground troops, but soon fell prey to the gruesome Gargoyle Brothers. Mephisto decided to turn the tide himself, and used Master Mayhem's portal to summon the Monsters of Evil, a quintet of demon-possessed monsters Venom had previously encountered. Mania commanded them to turn on the D.O.A., and they did so, freeing her from the Gargoyle Brothers and tearing the other D.O.A. members apart. Crossbones and Master Mayhem escaped, while Mephisto sent the Monsters of Evil away. Mephisto still refused to remove the Mark, but as they had mutual enemies who sought it, he told Venom to serve as her guardian, then left. Flash promised Andi, who had just been put through an emotional wringer, that he'd find a way to remove the Mark. (Venom: Space Knight#13 (fb) ) - When Captain America requested Venom join the Guardians of the Galaxy in space, he left Mania to her own devices in Philadelphia. They were both confident that she could keep the Devil's Mark in check. (Venom: Space Knight#13 (fb) ) - The Mark burned through the symbiote and bonded itself to Andrea, who gradually became darker and more violent. (Venom: Space Knight#12 (fb) ) - Totally consumed by her symbiote persona, Mania began living in the sewers of Philadelphia. (Venom: Space Knight#11 (fb) ) - When the Red Hand Gang sprung up in Philadelphia, Mania declared war on them. (Venom: Space Knight#9) - Mania brutally took down members of the Red Hand Gang in the sewers of Philadelphia. (Venom: Space Knight#10) - In Philadelphia, Andi separated from her symbiote and weakly called for help. (Venom: Space Knight#13) - Andi summoned winged demons to bring her symbiote back to her, and attacked Venom with a flaming sword; she prepared to take the symbiote back, but she was blasted away by the Space Knights and Venom's alien allies. She summoned more demons; while the aliens dealt with them, Venom went for Andi, tackling her and injecting her with a serum that brought her to her senses. Flash released her symbiote, and it bonded with her once more. Later, Mania and Venom watched the aliens depart, and she reflected on the fact that the cure was only temporary, and she was still cursed. 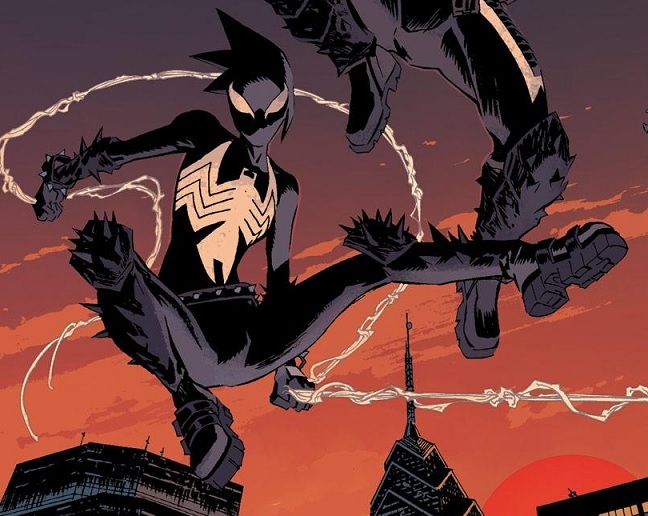 Venom tried to cheer her up, and they went on patrol together - at her insistence, he shifted into the Agent Venom form she was more familiar with. (Venom III#150/2) - In Philadelphia, Venom and Mania battled a group of lower demons. Afterwards, they had pizza, and Andi swung off for home. When Flash was subsequently ambushed and stripped of his symbiote, Andi helped him search for it, but they were unsuccessful. Comments: Created by Cullen Bunn and Declan Shalvey. Man, how did it take Marvel like 25 years to come up with the can't-miss concept Teen Girl Venom? Venom has, as of late, been in outer space with the Guardians of the Galaxy; hopefully he assigned someone (his ex-squeeze Valkyrie?) to babysit Mania. 2017 update: nope. Dammit, Venom. The symbiote clone is from the first Venom ongoing series; it was created as part of a far-reaching alien conspiracy to...do...something...listen, that series was really confusing. (Venom II#38 (fb) ) - Mr. Benton, a handyman, ended up raising his daughter Andi alone in Philadelphia, without her mother (who had numerous secrets that he never pried into) after some unknown fate befell her. (Venom II#38) - Benton tried to give his daughter some fatherly advice over breakfast. Later, while watching Wheel of Fortune, Andi excused herself, then returned minutes later with the villain Jack O'Lantern at her heels. Venom (secretly their upstairs neighbor Flash Thompson) soon arrived to defend them. When Benton tried to help him by attacking the villain with a wrench, Jack retaliated by stabbing him in the heart with his scythe. Benton's daughter held him as he died. (Venom II#39) - Benton's body lay in the apartment while his daughter, now bonded to a symbiote, battled Jack alongside Venom. Later, Andi attended his funeral.